With over 93 miles of spectacular coastline, and around 320 days of sunshine every year, it’s easy to see why the Costa del Sol's is one of the best loved holiday destinations in Europe. Then there is the delicious Spanishness of it all – the relaxed and easy-going attitude, the siestas, the wine, the festivals and the flamenco. We have not yet succeeded in turning it all into Little Britain, although there are places where it is easier to find a pint of Guinness than a jug of Sangria. But in villages like Mijas or the old town of Estepona you can still feel like a foreigner – in a good way! You need to decide if you want to hire a car or not – this will greatly affect your choice of holiday location. We have villas way off the beaten track, and others right in the heart of the community resort close to bars, beaches, bank and restaurants. Do you want to boogie till dawn or quietly sip a brandy at a beachside restaurant before returning to the comfort of your air conditioned villa? More than 60 golf courses! One of the best known resorts in the region is Marbella, famous for its glamorous nightlife and seafront. It is full of bright lights, bars and clubs. Benalmadena is also famed for its ritzy nightlife, and some streets are wall-to-wall bars and nightclubs just waiting to come alive after dark. There are many pubs, cocktail bars and clubs that just keep going till breakfast time. The area around the marina is partyville with top D.J. 's, live jazz, or salsa dancing till dawn – anything goes. Near the Port, the names of the venues give the game away – like Molly Malone’s Irish Bar, for example. In contrast to the lively nightlife of the Costa del Sol, there are many wonderful ancient villages and historic old towns to explore like Mijas Village with plenty of Spanish charm. Alternatively, the old quarter of Marbella is interesting - you can still find a traditional flamenco show, and there is a Moorish castle; the famous Orange Square and 16th century Town Hall. There are narrow alleyways that provide a great contrast to the urbanisations, apartment blocks, villa complexes and hotels of this major, modern resort. Places like Guadalmina may be relatively modern, but they are traditional in style. There are three water parks in the area, and the smallest and least busy of these is Parque Aquamijas, making it ideal for very young children. They will love the Kiddie Slides and Lizard Island, a new children's attraction built in 2014 with small pools and showers, connected by paths and bridges. Body Ski, Kamikaze, Black Hole, Rio Bravo, Adventure River, and Labyrinth Slides offer edgier entertainment for older kids. There is also a rock-climbing wall, mini golf, bar, self-service restaurant, gift shop and several Jacuzzis, as well as large shady picnic areas and gardens. Aquamijas is open from the end of April until the beginning of October. 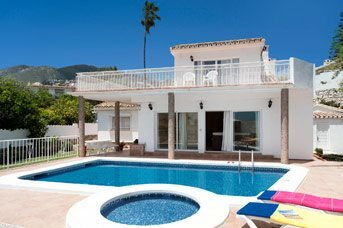 If you are new to the idea of a villa holiday, the Costa del Sol is great place to start. No matter how busy the beach becomes, you can always retreat to your own peaceful, luxurious, private pool at the villa. If you have had all the seafood you can face for a day or two, you can create a culinary masterpiece on your very own BBQ – that’s the freedom of your own villa. You can sleep in late with no maid knocking on your door, or get up and have a swim at 4 in the morning. Why not? The endless sunshine here means you can plan picnics and barbeques without even considering the weather! Choose your holiday resort and your villa, and then simply please yourself. It’s that easy! For something more quaint, the old quarter of Marbella is interesting - you can still find a traditional flamenco show, and there is a Moorish castle; the famous Orange Square and 16th century Town Hall. There are narrow alleyways that provide a great contrast to the urbanisations, apartment blocks, villa complexes and hotels of this major, modern resort. Places like Guadalmina may be relatively modern, but they are traditional in style. Benalmadena in the Costa del Sol is just around 12 miles from Malaga airport and has the privileged position of overlooking the Mediterranean Sea. Benalmadena is great if you’re looking for some variety on your villa holiday! 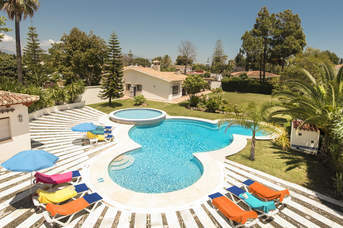 Villa holidays in Calahonda offer the chance to try out a wide range of beach sports, from underwater scuba diving to soaring above the ocean paragliding. If after all that you feel the need for some time with your feet on solid ground, why not enjoy some shopping through the market and boutiques followed by a fabulous meal. Campo Mijas is a picturesque inland area of countryside, elevated above and in between the coastal resorts of La Cala de Mijas and Fuengirola offering some spectacular mountain scenery. But it’s only a short drive from the beaches, shops and restaurants in the towns, as well as the popular marina at Fuengirola. The seaside town of Estepona lies at the foot of the Sierra Bermeja Mountains between Marbella and Gibraltar. At heart it is still a traditional Spanish town, although it has developed into a major holiday resort packed with urbanisations, apartment blocks, villa complexes and hotels. Fuengirola in the Costa del Sol is famous for its 5 miles of beaches and attractive promenade lined with high rise hotels and apartment blocks, lively restaurants, bars and a hectic nightlife. Guadalmina is a great destination for a sophisticated villa holiday. If you book today you could shortly be wandering the boutique shops and restaurants, taking a stroll down the promenade for a spot of people watching before selecting a spot for a bite to eat at a beachside restaurant, and don’t forget, there’s plenty to keep the kids busy too. Las Chapas is a largely upmarket residential area set on a hillside, within easy reach of Marbesa Beach. It’s a little over 7 miles away from Marbella and close to some excellent golf courses. Marbella is famous for glamorous nightlife and is one of the Costa del Sol's most elegant villa holiday spots – think Spanish St Tropez! The Golden Mile (actually 4 miles, all the way to Puerto Banus) of its seafront is full of bright lights, bars and clubs. Marbesa is a large, popular, man-made holiday resort along the stretch of coast known as Mijas Costa, between Fuengirola and Marbella. It is a well-established beach community sloping gently towards the sea, and was developed by Germans in the late 70s and early 80s. Mijas Pueblo is simply a delightful place for a villa holiday! It’s is a charming Andalucian white-washed village of alleyways, cobblestones and panoramic views perched on a mountainside 490 metres above sea level. Mijas Costa stretches between Fuengirola and Marbella, with easy access to both towns. Cabopino has a small marina with 169 moorings that are always occupied. Either side of the port there are good beaches beside a natural park of sand dunes and pine trees. Puerto Banus is located just west of Marbella before you reach the small town of San Pedro de Alcantara.The town is a very popular villa holiday destination with all the essential elements: endless sunshine, the port, marina and beaches, waters sports and boating, shopping and fine dining – and Villa Plus villas. San Pedro offers all you need for a great villa holiday but without burger bars and concrete tower blocks. Instead you have cobbled streets, a lovely beach and promenade, a chic and stylish marina, small independent shops and a great choice of bars, restaurants and clubs, all just over 6 miles away from all the glitz and glamour of Marbella. Those visitors who never leave the coastal strip will never appreciate that famous slogan ‘Spain is different’ run by the Spanish tourist office for many years. Costa del Sol is such an exciting and diverse region steeped in history and rich in culture and tradition that it deserves to be explored and enjoyed. By travelling a mere 10 miles inland to a rural village or town, even the casual visitor will begin to feel that he or she ‘is abroad’ and by going further afield to one of Andalucía’s provincial capitals, the feeling will be stronger and the reward greater. Undoubtedly the biggest attraction of the Costa del Sol holiday is the coastline. In the Marbella area alone there are no less than 24 beaches. Quiet, calm Guadalmina Beach is 1,600 meters long and 33 yards wide with a swathe of thick golden sand and sparkling clear water, ideal for wind-surfing and jet-skiing. The name Estepona is given to a huge area, covering 13 miles of coastline and 17 beaches. The largest at 1 1/2 miles long is Playa La Rada, a Blue Flag beach that is popular with the locals because of its great location near the centre of town. A smaller Blue Flag beach, Playa del Cristo is in a small sheltered cove to the west of the marina. It is particularly good for families as its clean sand sloping very gently into warm shallow water make it quite safe for children, watched over by the eagle eyes of the lifeguard. Cabopino beach is recognised as one of the finest in the region, and it’s located quite close to Calahonda. It can get very busy, so it’s best to arrive early. You can eat very well in the Costa del Sol – the food on offer is a blend of the exotic and the traditional, fresh sea food and tapas. You might find cold almond and garlic soup, lobster rice, suckling pig or goat on the menu. 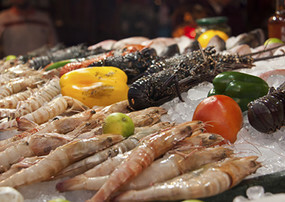 Most seaside resorts offer classy seafood restaurants and traditional tapas bars all along the promenade. If you fancy outdoor eating with a wonderful view and perhaps even a sunset, head to the chilled-out chiringuitos - beach bars - many of which are open at night serving traditional paella and fresh fish such as espeto de sardinas (charcoal-grilled sardines served on skewers), baby squid or fried anchovies. You can nibble on juicy olives, freshly baked bread and Spanish cheeses while sipping chilled Fino sherry, or more serious foodie delights such as pan-seared scallops and braised quail. Known simply as the Costa del Golf, this area of Southern Spain is golf heaven if you are that way inclined. There are around 40 high quality courses in the Costa del Sol such as Valderrama, La Reserva and Finca Cortesin, and most of them are in or near Marbella, with its superb year-round playing weather. Some of the courses have been designed by Golf’s big hitters such as Peter Alliss, Clive Clack and Severiano 'Seve' Ballesteros, the Spanish professional golfer and World No. 1 who died in 2011. Marbella is the perfect holiday destination for a golf enthusiast. Meanwhile, Guadalmina has a thirty-six hole golf course and 3 more great courses nearby, El Paraiso, Atalaya Golf and Monte Mayor. Within a 10 mile radius there are 12 more golf courses. Together they attract golfers from all over Europe. There is a vast and varied night scene on the Costa del Sol and each town has its own style and flavour of clubbing, beach parties and outdoor disco's. Marbella and Benalmadena are both well-known party hot spots that just keep going till breakfast time. The area around the marina in Benalmadena is partyville with top D.J. 's, live jazz, or salsa dancing till dawn – anything goes. Plaza Tutti Frutti is the centre of Nerja’s extensive club scene full of live music, street performers, flamenco shows, Irish pubs and disco-clubs where Europe’s beautiful people dance the night away. There is Puerto Banús with its luxury marina and shopping complex which is associated with conspicuous wealth and a party lifestyle. The town is still as fashionable as it ever was, and Marbella’s world-famous port continues to attract the jet-set, with all the nightlife you would expect to go with it. The Costa del Sol is the place to be for water sports enthusiasts and beginners alike. For example, Marbella has 24 beaches stretched across over 15 miles and most of them offer an interesting choice of water sports. You can go on a jet-ski expedition, hire a boat or kayak or go for a banana ride. You can try kitesurfing, flyboarding, waterskiing and wakeboarding, windsurfing and scuba diving. Go sailing, fishing or simply swimming, it’s all there for you in beautifully clear, clean blue water. You can sign up for a dolphin watching trip or a Rapid Rib Ride if your nerves are up to it! There are a number of professional outfits you can hire equipment from and plenty Cosmopolitan Fuengirola’s 5 miles of sandy beach offer a full range of water sports to choose from and Cabopino beach has its own water sports facility where you can hire, banana boats and jet skis. With over 100 miles of coastline, most of it accessible and with sandy beaches, the Costa del Sol is a beach lovers paradise. A day on the beach is very popular with residents and holidaymakers alike and in this section of Villaplus.com, we provide as much information as we can about the beaches, the facilities on offer, sporting and leisure activities and where they are located in relation to our villas. Some of the beaches are located directly off the main N340 coast road and down small tracks or lanes. Others, particularly in the main resorts have lovely leafy promenades where you can park and some have pedestrian promenade access only. Wherever you choose, there will be a restaurant or bar close by and with the months of July and August attracting more crowds than the quieter off season months. There are no private beaches in Spain although access might be across private land in which case watch out for the sign ‘acceso publico a la playa’. There are however, several nudist beaches on the Costa del Sol, ‘playa naturista’ which are well signposted. The Atalaya Beach is located on the eastern outskirts of the Estepona district and is easily accessed by exiting the N340/A7 at the “Benahavis” turn off and then taking the route to the Hotel Atalaya Park in Atalaya Baja. This section of beach is used by the visitors to the Golf Hotel Atalaya Park, but is also open to the public in general. Tucked into a small bay, the Atalaya beach is great for all ages including families and, due to the close proximity of the hotel, there is a variety of watersports available. There are also various beach bars along this stretch, which, in season, offer typical beach type food varying from snacks or a choice of fish and salads, to full “paella” lunches. This is a fairly new nudist beach located in cove 1100 yards west of the Torrequebrada Casino and Hotel and accessed from the N340. Benamara beach is located on the eastern outskirts of Estepona just 2 miles west of San Pedro de Alcantara close to the established residential area of El Pilar. The beach is easily reached by taking the pedestrian footbridge located across from the Benavista shopping centre. The beach has sunbeds for hire and a beach bar/restautant ideall for snacks and meals alike with paellas and seafood the specialities. Bil Bil Beach is the main beach on Benalmadena Costa and is situated off the N340, south of the town of Arroyo de la Miel and just west of Benalmadena port. Close by is the Bil Bil Castle, an attractive terracotta coloured replica Moorish Castle built on the promenade which houses a restaurant and bar and is the choice venue for many local weddings. The beach is well equipped with bars and restaurants, sunbed and umbrella hire, pedaloes and surfing.The main road behind is lined with apartments, shops, bars and restaurants and the attractive promenade provides a pleasant stroll or place to sit and watch the world go by. Carvajal is the pleasant and reasonably quiet beach area at the far eastern end of Fuengirola, before it leads on to Benalmadena Costa. The locals make a beeline for it at weekends, and tend to arrive early! However, it is wide, clean and safe with plenty of restaurants and bars close at hand. Access it by getting on to the Paseo Maritimo at Torreblanca and turning left. The Castillo (El Ejido) beach is located below the old Moorish castle on the western side of Fuengirola. The river separates it from the Santa Amalia beach, Fuengirola’s longest stretch of sand. The parking is good, although high season it gets a bit congested and the beach is a favourite with the local residents. Many new beach bars and restaurants have sprung up here over the past season and a new hotel is presently under construction on the promenade behind. The estuary of the river is popular and children swim in the small shallow lake before it reaches the open sea. Nets and posts are on site for various ball games enjoyed by the locals, also sunbed and umbrella hire from the various bars. The nudist beach at Costa Natura Estepona was Spain’s original purpose built complex which is completely walled and private. It can be found at Km 151.5 on the N340 just to the west of Estepona and has a roomy car park just off the main road. Daily membership is available. Located just east of Estepona, El Padron beach is a popular stretch of sandy beach with several beach bars and restaurants and facilities such as sun bed and umbrella hire. The luxury Hotel Kempinski overlooks the beach at Km 159 off the N340 coast road and offers many water sports and activities, such as boating, diving and snorkelling, wind surfing and pedalos. The main beach at Estepona is the Playa de la Rada, a fine long and wide stretch of sand overlooked by a pleasant tree lined promenade with gardens and children play areas with many restaurants and bars to choose from. The beach was awarded the Blue Flag in 2002 and has excellent facilities. There is parking along the promenade although in high season it gets quite busy. Other public parking close by. Another beach in Estepona is the Blue Flag Playa El Cristo found just to the west of the town and within easy walking distance of the town and the marina. Located in a cove it is a west facing beach, with bars, showers and parking. Playa Fontanilla is the very popular beach lying west of the sporting marina and connecting with the Playa Casablanca, together they stretch almost to the western side of Marbella town. A lovely promenade overlooks this extensive stretch of coast, which offers clean safe bathing and excellent facilities. Plenty of restaurants and bars with toilets, showers and the usual sunbed and umbrella hire. Water sports such as speed boat and jet ski hire are available from the marina but windsurfing and pedalo hire centres are located at various centres along the beach. Access beach from any side street off Marbella main street between the Hotel Skol and the Hotel Don Pepe. Funny Beach, advertised by a giant sized Coca Cola can on the beach side just east of Marbella town has a variety of water sports available such as jet ski hire, canoe and pedalo hire and wind surfing. For children and adults they also have go karting, trampolines, and many other amusements. The beach itself (Playa del Pinillo) is quite narrow, but safe and clean with toilet, restaurant and bar facilities. There is no promenade as such, but the beach can be accessed directly off the N340 coast road and parking is available on site. Marbella's Golden Mile is without doubt the place to be seen with its beaches, world famous hotels (including Puente Romano Hotel) and designer shops. The golden mile coastline is made up from many different beaches between Marbella and Puerto Banus and is flanked by a recently built promenade with is many beach bars dotted along the way. These beaches have held the Blue Flag since 1992. If you feel like treating yourself, why not spend a day relaxing in the Marbella Club Beach Club. This lovely beach is overlooked by the fabulous Guadalmina Golf Course and Hotel on the western outskirts of San Pedro de Alcantara and has excellent facilities and a clean safe beach with many restaurants and bars close at hand. There is the usual sun bed and umbrella hire and varied water sports and activities available from the hotel such as windsurfing, jet skiing, speed boats and pedalos. Reach the beach by turning off the N340 just before the concrete arch travelling west out of San Pedro. Situated at Km 163 on the N340 coast road east of Estepona, Hacienda Beach is close to the luxury Las Dunas Hotel which has all manner of water sports and leisure activities on offer. The beach is clean, safe and well equipped with a variety of restaurants and bars, toilets, sun bed and umbrella hire and beach showers. 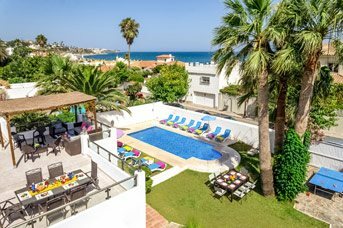 La Cala is a self contained resort located 4 ½ miles or so west of Fuengirola on Mijas Costa that is full of Spanish charm and atmosphere. Take the La Cala exit off the N340, park at the back of the town by the shops and walk down to the beach area. Nice sandy beaches, well equipped with many bars and restaurants close at hand. Fishing boats and nets on the beaches all add to the atmosphere of this very pleasant resort which unfortunately does get quite crowded during July and August. Worth a visit though, but arrive early. Pedalo hire and some wind surfing. Once upon a time, La Carihuela belonged to Torremolinos and was its fishing area. Nowadays, located on its western outskirts, La Carihuela still retains its charm and quaintness with narrow streets, a lovely new pedestrian promenade lined with fabulous fish restaurants and an extensive stretch of sandy beach with beds and umbrellas for hire, pedaloes, windsurfing and bars with showers and toilets. Find it by heading down to Montemar/Carihuela in between Benalmadena Port and Torremolinos. The Marbesa beach is a long narrow stretch sand popular with local residents. There is no promenade here but the rather quality residential area of Marbesa overlooks it, with plenty of parking. A good choice of restaurants and bars some having sunbeds and umbrellas for hire. Popular with the locals for jogging and walking. Take the Las Chapas exit off the N340 and head down to the beach. Mijas Costa is the long stretch of coast between Fuengirola and Marbella along which many urbanisations have sprung up on the inland side of the N340 and pedestrian bridges and under passes have been built to enable access to the many beaches. The majority of the beaches are sandy but fairly narrow. The urbanisations of Riviera del Sol and Calahonda all have access to reasonable beaches where a beach bar or restaurant is never far away and they will all have toilets and sunbed and umbrella hire. The Nueva Andalucia beach is situated a 15 minute stroll west of Puerto Banus and is sandy and well equipped. Several beach clubs overlook the beach, including the Moosh Moosh at Villamarina and although not a formal promenade, it is an easy walk into Puerto Banus to enjoy the nightlife and shopping. A good choice of beach restaurants and bars with toilets, showers and sunbed and umbrella hire. Windsurfing and pedalo hire available and jet ski and speed boat hire from the marina itself. This beach is located close to the Artola Hotel and Golf Club on the N340 coast road east of Marbella. It is also known as Playa de las Dunas-Carib and is a naturist beach. It can be best accessed by the Cabopino exit off the N340 and turning right into the sand dunes before arriving at the marina. You will see signs for Andres beach bar. Usual facilities with sunbed and umbrella hire and toilets. The Rio Real beach is located in front of the Rio Real Golf course, stretching down to the sea at the Torre Real exit just east of Marbella. Turn off the N340 coast road and follow signs down to the beach past the old Moorish watchtower. At the bottom there is plenty of parking and access to the beach. The beach boasts a first class restaurant and bar, with pool and gardens and from where you can hire sunbeds and umbrellas on the beach. Pedalo hire and windsurfing are available. The Rio Verde Beach is situated just a 10-15 minutes walk to the west, to Puerto Banus. Puerto Banus is the ideal place for an exclusive selection of designer shops, restaurants and nightlife entertainment , together with an incredible display of yachts and pleaseure boats in the Marina. To the east, towards Marbella town at a distance, the beach is mostly boarded by a relaxing promenade and leads you along the 'Golden Mile' streach of beaches with its array of top grade Hotels, beach bars and beach clubs along the way. . Windsurfing and pedalo hire are available as well as jet ski and speed boat hire, at selected beach areas on this part of the Marbella coastline. Playa Puerto Banus is another very popular beach and without doubt the place to be seen! Protected to the west by the marina jetty, it stretches along to the east and is overlooked by the Marbella Club. If the beach was crowded you might be tempted to spend a day at its beach club and rub shoulders with the rich and famous. If not, then be prepared for a crowded beach. Lots of bars and restaurants close at hand and the usual facilities. Parking best under the El Corte Ingles Store or the public car park in Puerto Banus – the latter is quite expensive. These three popular beaches located together around the Elviria area at Kms 189, 191 and 192 off the N340 coast road, all have very good facilities with plenty of restaurants and beach bars and adequate parking. They are all reached down small roads through urbanisations and there is no promenade linking the three. Needless to say they do get busy during high season, especially at weekends with the locals but with daily cleaning, the beaches are safe and the atmosphere is always good. Royal Beach is on Mijas Costa in the Sitio de Calahonda area. Access the beach by turning off the N340 at Sitio de Calahonda and taking the narrow road down with Mcdonalds on the left side. There is a car park and a flight of steps lead down to a fairly narrow beach with a restaurant and bar and sun bed and umbrella hire. Very popular at weekends when parking could become difficult. Sabinillas is a fairly large coastal town located on the N340 coast road in between the exits for the inland villages of Casares and Manilva. Not regarded as a holiday resort, the long sandy beaches are popular with the locals and those that know about them with good facilities including bed and umbrella hire. A real Spanish town with good shopping and a weekly market that is well worth visiting for its beach and typical bars and restaurants serving exquisite fish dishes. No promenade as such but plenty of parking in the little side streets leading down to the beach. San Pedro is an attractive market town with its centre lying around 1100 yards from the coast on the N340. San Pedro beach is one of a series of long clean sandy beaches running from Puerto Banus to Guadalmina. Beaches near San Pedro Alcantara have long wide tree-shaded promenades, children’s playgrounds and plenty of beach bars and fish restaurants. The promenade and beach areas are attractive with good safe bathing and sports facilities. Sotogrande at the far western end of the Costa del Sol and close to Gibraltar, is a top venue for golf and polo. It also boasts a fabulous marina with wildlife marshland and is a luxury beach resort. The fine beach club backs on to the wide sandy beach which is safe and clean for bathing and taking the sun. At the beach club there are many water sports and activities available, including pedalos, jet skis, speed boats, windsurfing, childens games and competitions, tennis and golf. Also on site are excellent restaurant and bar facilities. Torreblanca and the adjoining resort of Los Boliches, both located on the eastern side of Fuengirola were awarded the Blue Flag for their beaches in 2002. Wide expanses of sand stretching several miles from Fuengirola along to Carvajal attract holiday makers and locals alike and the facilities are first class. Plenty of beach bars and restaurants offering wonderful fish dishes and fresh char grilled sardines, sun bed and umbrella hire, toilets and beach showers. Water sports on offers include pedaloes and windsurfing with several locations for 5 a side football. Well located just off the N340 at the Torremuelle exit with several beach bars and restaurants close at hand. The sandy beach is not huge but is clean, safe and well equipped with sunbed and umbrella hire, pedaloes, toilets and showers. Parking on beach side is limited in high season but spaces available on other side of the road, with underpass access. Another popular beach on Benalmadena Costa is at Torrequebrada and access is from the N340 via the huge building which is the Torrequebarada Hotel and Casino on the beach side. The beach has a couple of restaurants and bars with toilets and showers and all the usual facilities such as sunbed and umbrella hire, pedaloes and surfing. Parking is a little difficult in high season. One of Marbella’s fine beaches, Venus Beach is located to the east of the sporting marina. A pleasant promenade overlooks the beach, and houses many popular restaurants and bars that are full to bursting point during the high season months. The beach is clean and safe with excellent facilities including toilets and showers, sunbed and umbrella hire, jet-ski and speed boat hire close by from the marina, pedalos and wind surfing. Try to park in the Avd. Puerta del Mar or Plaza de la Victoria car parks just off Marbella’s main street and walk down to the beach. The Costa del Sol is known for many things: Sun, sea and sand are the usual three that holidaymakers are keen to mention, but one thing that they really shout about is the food. The area is known for blending the old and the new when it comes to cuisine, and there is a lot to experience in the more authentic, local restaurants. If you really want to see the true Costa del Sol, there are few better ways to experience real Spanish culture than with a visit to a local produce market. The area has an abundance of them, though not all of them are food produce specific, and many of the opening times and days vary throughout the seasons – it's always best to check when you arrive so you don't venture out on a wasted journey! For fresh fish and meat, fruit and veg, you will find that most towns will have a local Municipal Market, usually located near the heart of the old town - known locally as the Mercado Municipal. These local markets are usually only open in the mornings, generally between 9am and 1pm, with stalls displaying a great selection of fresh foods. Each town will also have a specific day for their weekly "Rastro" markets which offer a combination of stalls, ranging from clothing to leather goods with a healthy dose of locally farmed produce too! As with the majority of Spain, in Costa del Sol, be sure to expect a good punch of colour and flavour that has been perfected over hundreds of years. Whilst some dishes will have some modern touches, many of the region's favourites are old recipes that have been made time and time again – be sure to give something unexpected a try when you visit. 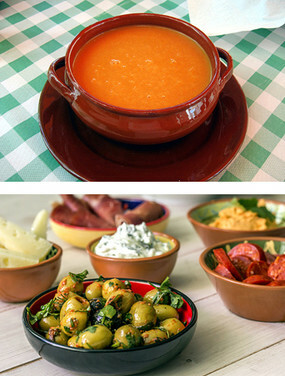 Gazpacho Andaluz – This dish is a founding member of the gazpacho family, and is a soup-like dish made from tomatoes and dried bread that’s served chilled. Well-seasoned, this dish is refreshing and tasty, and is best served with freshly chopped peppers and onion. Tapas – Costa del Sol is no exception to the Spanish love of tapas. These small plates are full of different ingredients and different tastes which can be mixed and matched with others to create an exciting dinner atmosphere, or can be great if you just fancy a small plate for a light meal. You can read more about the tapas dishes that the area is known for in our Guide to Costa del Sol. As an area that fully embraces the Mediterranean location, you can't help but associate the taste of their food with sun and holidays. On a warm summer's evening, just serving up the right kind of food can even make dining in at home into a treat that feels distinctly Spanish, especially if you've got the right recipes to hand. 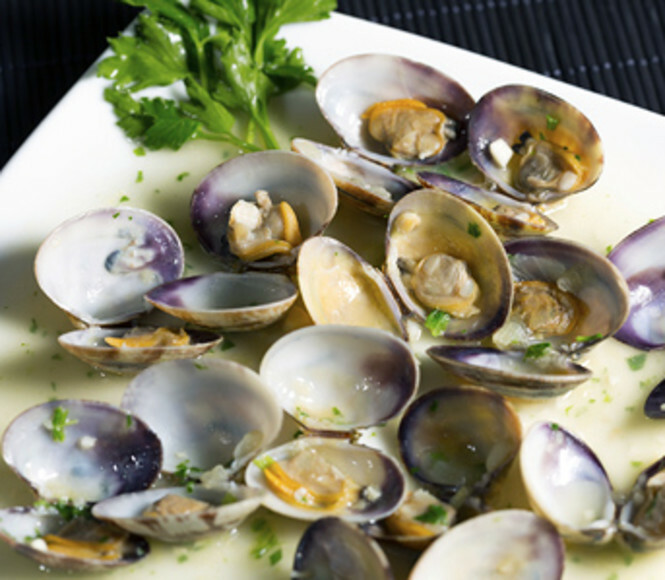 Clams are a large part of the Costa del Sol foodie culture, as is the traditional dessert dish of Churros con chocolate. Follow these recipes and you’ll have two popular dishes to serve up that are sure to make any stomach smile! This recipe is simple but delicious, relying on high-quality ingredients to achieve that authentic depth and flavour. With the clams, fresh is obviously better, and you’ll need to wash them thoroughly until they’re sand and dirt-free. Place them in a casserole dish or stew pot on a medium heat and stir in the onion, garlic and parsley. Cook for a minute or two, then sprinkle with flour, salt and pepper and turn the heat up. Once the clams have opened up and softened, the dish is ready to serve straight from the pot. Sprinkle with parsley to serve. Firstly, mix together the flour and the baking powder in a large bowl. Then, mix through the olive oil and water to form a dough. Once the dough has reached the desired thick but flexible consistency, leave it to rest for around 30 minutes. After the dough has rested, heat the oil up in a sturdy frying pan and allow it to heat up – the oil should sizzle. Fill a piping bag with your doughy mixture, and slowly pipe in reasonable lengths into the frying pan. It’s important to keep a pair of scissors handy here so you can cut the dough when it’s at the right length! Allow them to cook until golden, covering if necessary to ensure an even cook. Carefully remove the churros from the frying pan once cooked, and sprinkle the castor sugar whilst they’re still warm. For the chocolate dipping sauce, you should melt the two types on chocolate together, and stir to combine. To loosen the chocolate up, add a little of the milk and stir, continuing until you are happy that the churros can be dipped! 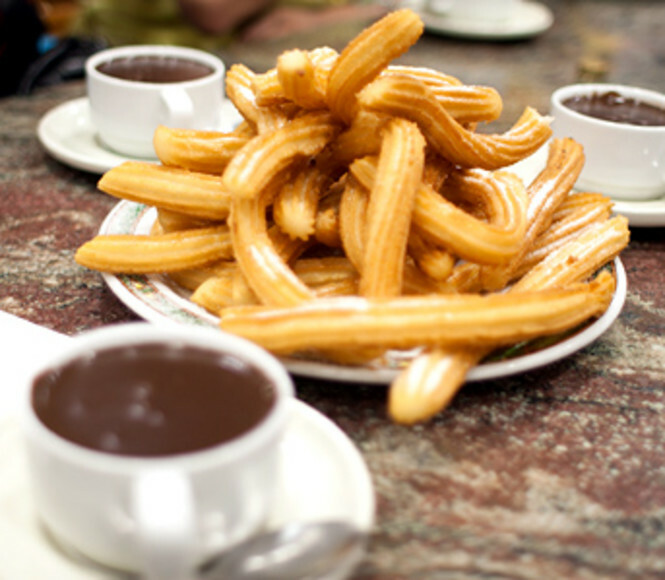 Serve the churros warm with the chocolate dip on the side, and enjoy!